Looking for a fitting tribute to house your pet's memory? Think about a hand-crafted pet urn made especially for your family's need. This made-to-order resting place, pictured above, was custom designed for "Noodle," a beloved Golden Retriever. 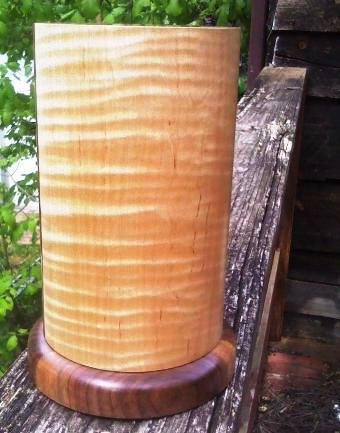 The urn above measures as follows: the center cylinder, made from curly maple, measures 4.25 inches in diameter. The walnut base cap measures 5 inches in diameter. The total combined height is 8 inches and can accommodate the remains of a pet who weighed up to 40 pounds. A brass plate on the bottom can be removed for engraving at one’s local jeweler. May custom order a different size or style based upon personal need.